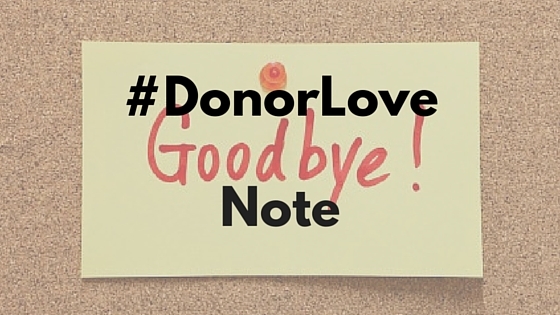 #DonorLove Goodbye Note | What Gives??? I hope this email finds you well and [insert something personal here… show them right off the bat that you’ve been listening and that you care] enjoying your summer. Have the kids made it up north much? I hope all is well with you and the family. I’m writing with some bittersweet news: at the end of this month I’m leaving [your charity… for your new job. Share as much information here as you’re comfortable sharing] my position at Laurier for a new job in Toronto. It wasn’t an easy decision, but I’m looking forward to my new adventure. The hardest part is always leaving the great people I’ve worked with, especially donors like yourself. But rest assured I’ve kept good notes of our conversations, and my successor will be able to pick up where we left off when she or he starts. [Insert something specific about their giving here, if applicable] I know you were interested in reactivating your monthly donations at some point, so perhaps that’s an introductory conversation you can have. And [Name], thank you for making my experience at Laurier so incredible. Generous donors like you inspired me every day!